Here at Who What Wear, we're always seeking out the newest trends. And speaking of trends, ankle boots are highly popular this season, so we wanted to find new, fresh ways to wear them. Curious, we turned to the chicest celebs to explore their styling tactics. 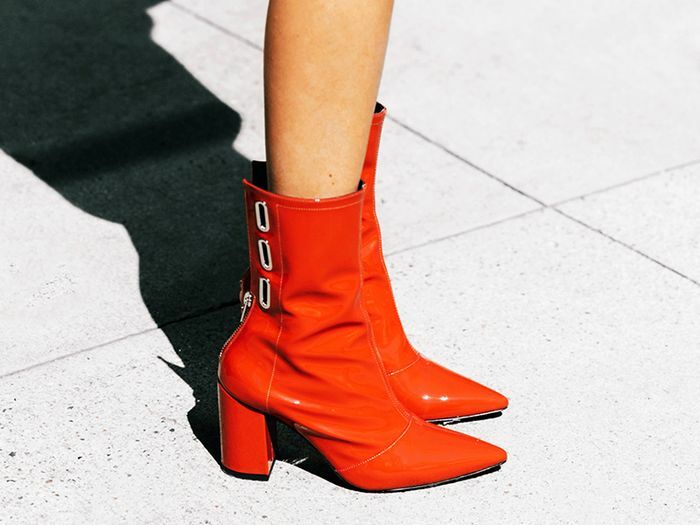 After we combed through some of their strongest looks, it became apparent that the best way to wear ankle boots in 2018 is to wear them with straight-leg denim. Let us explain: Over the last couple of months, Gigi Hadid and Kendall Jenner have been spotted wearing pointed-toe sock boots with vintage denim. They allow their jeans to sit over their boots, elongating their legs. In addition, Rihanna was seen wearing an Off-White ensemble consisting of straight-leg jeans and heeled white boots. Can you think of a more winning combo? Keep scrolling to see how Gigi Hadid, Rihanna, Kendall Jenner, and Kaia Gerber style their straight-leg denim. Pair vintage denim with a matching jacket and cropped tank. Finish off the look with bold, pointed-toe boots. A cropped jacket shows off the waist. Wear this underwire top with high-waisted denim. Wear these with pointed-toe boots to get Gigi's look. Ideal shoes for the New Year. Tiny sunglasses are predicted to make a huge statement in 2018. Rihanna's Off-White ensemble came straight from the runway. Copy her look by slouching straight-leg jeans over white booties. To achieve Rihanna's look, pair this neutral blouse with some vintage denim. Available in sizes XS and S.
Let the straight-leg hem fall over your boots. Wear these white boots into spring. Style this vintage bag with a minimalistic outfit. For a night out, style black patent boots with a statement top and fur bag. Simply throw on your favorite high-waisted denim, and you'll be good to go. This cropped sweater is casual yet refined. Straight-leg denim is classic and easy to style. Available in sizes 34 FR to 42 FR. Patent boots are both classic and on trend. Available in size 5 to 11. L.A. girls love this local brand. A favorite of Kendall Jenner. Military boots are making a comeback this season. To liven up your outfit, wear them with a fun sweater. This colorful sweater will add a bold touch to your look. Everyone needs a staple leather jacket. High-waisted denim is an undeniably flattering cut. Platform boots are stylish and practical for cold weather. Try an oval-shaped frame for your next sunglass purchase. Next, check out 25 different ways to wear mom jeans.